Munchkin till you drop â€“ just add players! 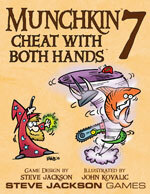 This set replaces both Munchkin Blender and More Good Cards, which was the original Munchkin 7. We didn't want to reprint More Good Cards, because it was only 56 cards and most of those were originally from Munchkin Blender, anyway*. We didn't want to re-use the name Blender, since this new set â€“ by popular demand â€“ has the classic Munchkin brown card backs rather than Screaming Purple Cards. And we didn't want to eat our vegetables, because vegetables are yucky. This is yet another expansion adding cards to the original Munchkin game. These cards won't change the overall gameplay dramatically, but they mix in very well in large Munchkin decks and bring back some of the original feeling of fast and furious play. Cheating is handled very nicely by Munchkin through the use of cheat cards, and this expansion adds plenty of opportunity to explore that great mechanic further (hence the name).